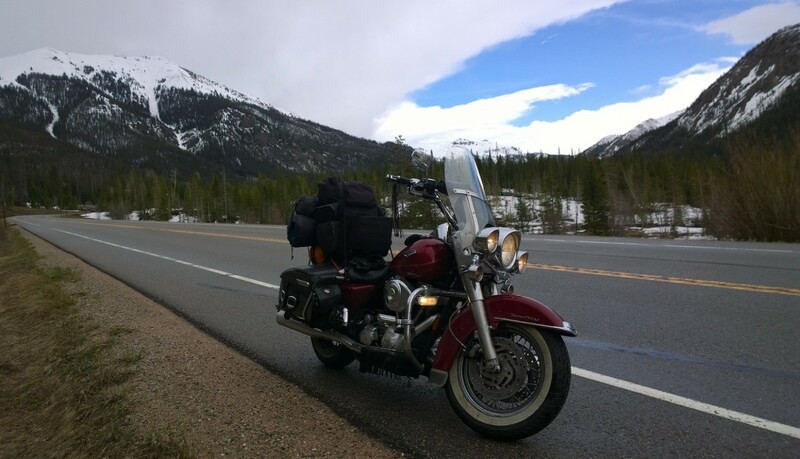 Day 12 Continued: One of my Best and Worst Rides, Weather, Road Conditions, Finally in Walden, Colorado. This report will be brief because I’m still in a bit of shock and recovering. Let’s just say that it was one of the most beautiful rides in terms of scenery that I’ve ever been on. Under the worst conditions possible. Twisting roads, sharp switchbacks and curves and then as I climbed higher into the mountains the rain began to fall and I started to get wet and cold. And colder. Big Red and I dodged fallen stones and small mud/stone slides. When I reached the mountain’s peak at 10, 200 feet the snow began to fall. First time I’ve ever ridden a bike in a snow flurry. It was a very tough and challenging ride. Still, I loved it. And I’m thankful. I made it to Walden and got a room at the rustic Angler’s Inn and I ain’t going nowhere. ← Day 12 Morning: Colorado! Rocky Mountain National Park, 12,183 feet.